The Battle of the Lys (also known as the Lys Offensive, the Fourth Battle of Ypres, the Third Battle of Flanders (French: 3ème Bataille des Flanders) and as the Batalha de La Lys in Portugal) was part of the 1918 German offensive in Flanders during the World War I (also known as the Spring Offensive), originally planned by General Ludendorff as Operation George but scaled back to become Operation Georgette, with the objective of capturing Ypres, and forcing the British forces back to the Channel ports (and thereby forcing Britain out of the war). 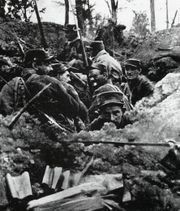 Starting on 9 April 1918, the battle lasted until April 29. 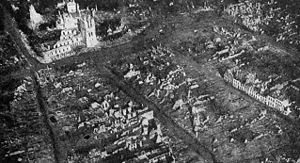 The attack was similar in planning, execution and effects, although with smaller dimensions, to the earlier Michael operation, also from the Spring Offensive. Erich Friedrich Wilhelm Ludendorff (sometimes given incorrectly as von Ludendorff) (9 April 1865 – 20 December 1937) was a German Army officer, victor of Liège, and, with Paul von Hindenburg, one of the victors of the battle of Tannenberg. From August 1916 his appointment as Generalquartiermeister made him joint head (with von Hindenburg) of Germany's war effort. From this point on he ran Germany's war effort in World War I until his resignation in October 1918.